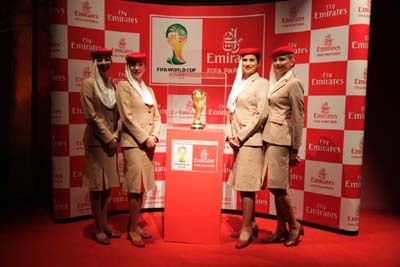 Emirates Airlines is giving its flyers the chance to win tickets to Fifa World Cup 2014 final. Emirates Airlines offering its Skywards member this chance if they fly between April 4 and May 31, 2014, and the chances at winning are greater if you simply fly more. “If you earn the highest number of Tier Miles, you’ll win VIP hospitality match tickets and return flights to Rio de Janeiro from Dubai. Our next 13 top-scoring members will each win a pair of tickets to watch the final from the best seats in the house. The more you fly, the higher your chances of joining football fans from around the world to watch the champions lift the coveted trophy. Register now and every mile you fly could take you a step closer to the action,” says the airline. Emirates flies daily from Dubai to Brazilian cities of Rio de Janeiro and São Paulo. Currently, there are no special offers on this route that can be availed of but the airline offers discounted tickets periodically. Soccer lovers should book seats in time to avoid disappointment as Emirates is unlikely to add extra services to Brazil in the lead up to the Fifa World Cup. The event will be hosted from June 12 to July 14, 2014. An Emirates spokesperson was quoted in the press as saying that there are no plans to add extra flights but added this could be reviewed if required. Emirates has been committed to sponsorship for big events the world over. Football remains one of the most prominent sports within Emirates’ sponsorship portfolio which is demonstrated through on-going partnerships with Fifa and some of the biggest names within European club football. Emirates also sponsors and is associated with other sports like rugby, tennis, motorsports, cricket and others.